A mantra is a sound, syllable, word, or group of words that are considered capable of "creating spiritual transformation". The Gayatri is one of the oldest mantras, and amongst the highest and most powerful mantras of all. It is called "The Mantra of Spiritual Light" because it infuses the Spiritual Light of Creation into all the seven Chakras. It is addressed to God as the divine life-giver, symbolized by Savitr, the Sun, 'that from which all this is born.' Gāyatrī is considered the veda mata, the mother of all Vedas (the Mother of Knowledge). Gāyatrī is represented with five heads and with the ten eyes looking in the eight directions plus the earth and sky, and ten arms holding all the weapons of Vishnu, symbolizing all her reincarnations. 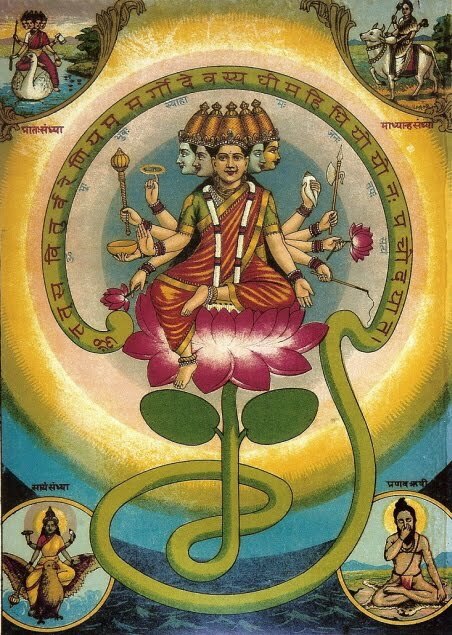 Gayatri has three names: Gayatri, Savitri, and Saraswathi. Gayatri is the master of the senses, Savithri (who brought back to life her dead husband) is the master of Prana (Life Force), Saraswathi is the deity of speech (vaak). The three are in each of us as the senses (Gayatri), the power of speech (Saraswathi), and the life force (Savitri). They represent purity in thought, word, and action (thrikarana shuddhi). Sathya Sai Baba teaches that the Gayatri Mantra "will protect you from harm wherever you are, make your intellect shine, improve your power of speech, and dispel the darkness of ignorance (Dhiyo Yonah Prachodayath)". The Gayatri may be considered as having three parts: (1) praise, (2) meditation, (3) prayer. The ideal times for chanting the mantra are at sunrise and at sunset. The maximum benefit of chanting the mantra is said to be obtained by chanting it 108 times! However, one may chant it for 3, 9, or 18 times when pressed for time.